Why grow old when you don't have to? Weight training can not only slow down the ageing process, it can actually reverse it. Find out how to turn back the clock and build a fantastic body. You Might Live For a Thousand Years! Did you know that weight training can now only slow ageing down, it can actually reverse it? That’s right, working out in the gym might just be the magic elixir that people have been seeking for centuries. A lot of research is turning up evidence that supports this surprising claim. For example, the McMaster University Medical Centre in Hamilton, Ontario conducted research on a group of over 65 year olds. They were asked to take part in training – mostly for the first time in their lives – while the researchers checked changes in their biology. The results were very surprising. Not only did most of the subjects reverse muscle loss into muscle gain, the change was found to be happening at the genetic level. These seniors were developing genetic patterns resembling those less than half their age. Wendy Ida is a 63-year old grandmother who competes against much younger women. She looks pretty good, right? So you might be surprised to learn that she is actually a 63-year old grandmother who regularly competes against much younger women. Or how about this guy? 70 years old and still packing great abs. Not bad for a guy who has now turned 70, right? Sam “Sonny” Bryant says ‘you are going to age, but you don’t have to get old. There is no age limit to staying fit and healthy.’ Hang on, though, we’re not done yet. Want to look like this when you are nearly 80? You can! 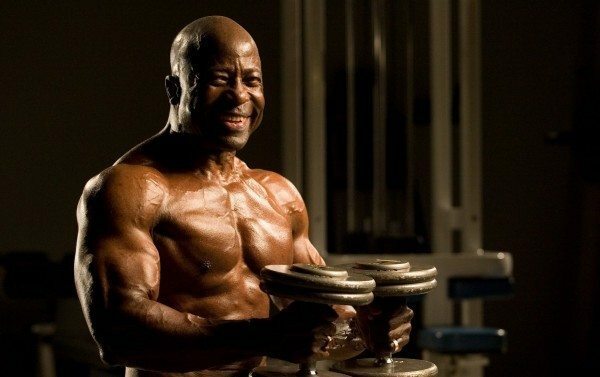 This bodybuilder is still looking great at 78. Jim Morris is no less than 78 years old, but he could out-compete many guys half his age. So could Ernestine Shepherd, who is also 78. Does your grandmother look like anything like this? Working out keeps her looking great as she approaches her 80s. Ernestine not only continues to weight train every day, so actually teaches it, too. Her students know she is on to something, because some days the classes are so full they can’t fit everyone in the room. But so far, we’ve only been talking about the youngsters. So let’s step it up another notch and look at the really senior bodybuilders. 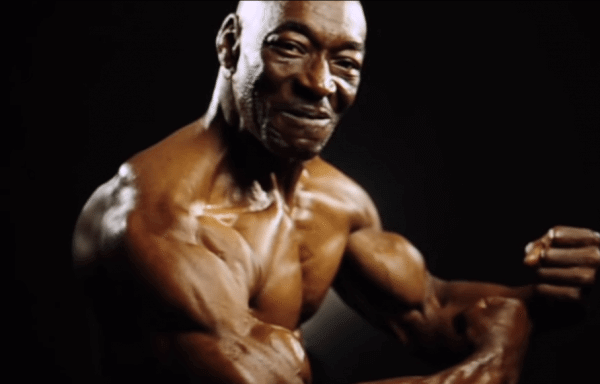 Charles Eugster started pumping iron at the age of 87. ​Since then he has won three weight lifting titles in his age group, as well as breaking a world record for sprinting. He says he does weight training so that he can impress the young 70-year old ladies on the beach. 95-year old Charles want to impress the young 70-year old ladies on the beach. OK, let’s squeeze in just one more. If you thought you would definitely be past it when you hit the century mark, think again. 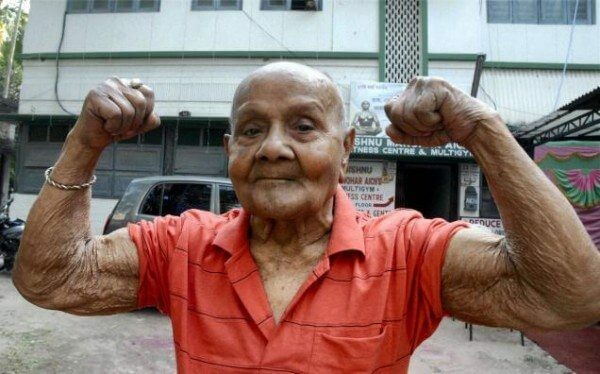 Manohar Aich from India is an astounding 103 years old, yet he still lifts weights every day. Well past his century and still lifting weights! Traditionally, we think of ageing as an unfortunate but inevitable aspect of life. We simply have to accept that as we get older, our bodies will gradually decay and we will become weaker and weaker until something vital stops working altogether, and we die. Whichever way you look at it, this is a depressing thought. However, science is now showing that ageing is perhaps not as inevitable as we have always assumed. It turns out that many of the processes we associate with ageing simply the result of misuse. As we get older, we become less active, so our bodies have less incentive to build muscle and bone, and to keep everything in tip-top condition. But if we commit to a regular program of weight training, our bodies get shocked back into life. ​They start building fresh muscle and strengthening bones. Our nervous system begins to function more efficiently, and we recover our balance and our stability. To understand how this happens, we need to look at biomarkers. These are measures of important biological states within our bodies, and are a good indication of our general health. Reviewing ten important biomarkers shows just how valuable weight training can be in keeping us youthful. Muscle mass is the most important of the ten biomarkers. After age 40, we typically lose a significant amount of muscle every year. So by the time we reach age 70, our muscle mass is severely depleted. But research has shown that weight training several days a week can reduce muscle loss to next to nothing. It’s not hard to work out that as you lose muscle, you also lose strength. Weight training helps you reverse that loss, so that you can remain strong and vital for decades. As you lose muscle through the years, your basal metabolic rate slows, too. So strength training helps to keep your metabolism functioning as well as it always has. In today’s world, most people pile on a few extra pounds as they get older, and we all know that this bad for health in all kinds of ways. Weight training helps to offset by building more energy-burning muscle, increasing metabolism and consuming calories in every workout. If you are not breathing optimally, clearly your body cannot function efficiently. Weight training and the associated cardio exercises help to prevent the loss of aerobic capacity that occurs as we age. One research study showed that 12 weeks of strength training can increase treadmill walking endurance by 38% in the over-65s. That’s a big improvement! By the age of 70, 20% of men and 30% of women have an abnormal glucose tolerance curve, which can lead to diabetes. Strength training helps to improve the metabolism of glucose, keeping everything in the healthy range. To stay healthy, we need to consume more good cholesterol and less bad cholesterol. Weight training is a great way to stay fit and keep this ration in the correct zone. High blood pressure is a major risk factor for heart attacks and strokes, as well as other coronary diseases. A recent study indicated that regular strength training by seniors resulted in both a lower heart rate and lower blood pressure. As we age, the mineral content in our bones tends to decline, and they become weaker and more brittle. Weight training not only builds muscle, it promotes the growth of the associated bones, too. Many old-age health issues are associated with lower body temperature. Regular exercise – especially strength training – can get the body’s temperature-control mechanism back on track. As we have seen, all ten of these critically-important bio-markers can be significantly improved through weight training. However, muscle mass and strength are the two most important bio-markers by far – and weight training is clearly the most effective way to enhance both of these. A regular workout in the gym really can do wonders for your long-term health and fitness…and longevity. And it’s not just your body that benefits. Other studies suggest that weight training is very good for your brain, too. As well as improving long-term memory and alleviating mood disorders such as depression, strength training seems to help with serious diseases such as Parkinson’s and Alzheimer’s. It even improves your IQ, too. Cambridge scientist Aubrey de Grey suggests that people who will live to be 1000 years old are already alive today. He predicts that as science develops, we will just keep pushing back the age at which people are expected to die, so that people live longer and longer. So if you want to live to see the year 3015, get down to the gym and start working those weights!